Leah is the Director of Marketing & Client Engagement at Matrix Group. She manages the marketing efforts for Matrix Group and is an integral part of the new business team. When she's away from her desk, you can often find her: dining out in Philly where she lives with her husband and brand new baby boy, soaking up every nanosecond of mom-hood, hitting the gym, and experimenting with gluten-free baking. Leah loves any and all challenges, and is currently determined to bake the perfect loaf of gluten-free bread. She promises to share the recipe on her food blog once the goal is achieved! If you’re in marketing, you know how time consuming posting and monitoring social media can be. It can easily swallow hours of your work day. Yes, hours. As I mentioned before, I’m all about the productivity hacks this year, and am diving deep into the world of Chrome extensions to try to streamline my work and personal life. My current favorite extension for efficiency in the social media department is the the Hootlet extension for Chrome and Firefox. If you use Hootsuite to manage your social media accounts like we do, you need this, plain and simple! Why is it so great? It allows you to share articles or web pages that you are reading/visiting, without ever having to switch tabs or copy/paste a single URL or string of text. While it may not seem like either of those things are that much of a nuisance, you’d be shocked at how much time the back-and-forth swallows, and how easy it is to get lost and distracted when you’re juggling 15-20 tabs at once (that’s not just me, right?). 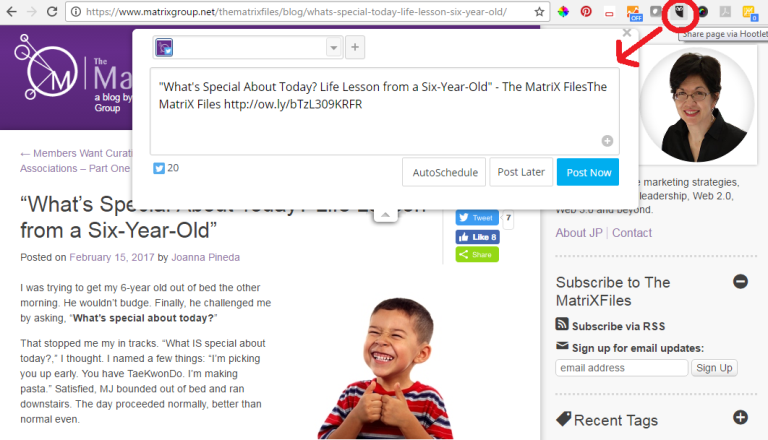 With the Hootlet extension, all you have to do is click the Hootlet icon in the browser toolbar, and the familiar Hootsuite draft box will pop up on the webpage, pre-populated with the page title and URL. From there, you can customize your message, add a photo or attachment, and choose to either share the social media post immediately or schedule it for later, without ever leaving the webpage. Life changing! Another cool feature? 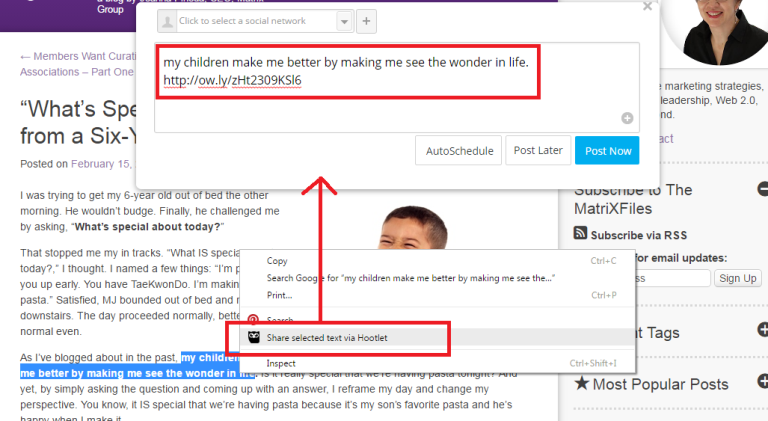 If you see a quote in an article that you’d like to share, you can quickly do so by highlighting the text, right-clicking, and clicking on “share via Hootlet.” The draft box will then pop up with the highlighted text, and a shortened link to the article. Sharing made easy! Can’t beat that. What are some of your favorite social media productivity tools? For me, 2017 is all about productivity hacks and working more efficiently. Recently, I’ve been diving deep into the world of Google Chrome extensions to help me streamline as much of my work (and personal life) as possible. One of my current favorite tools is the Page Analytics extension for Chrome. With just a quick glance, it shows you how your users are interacting with your site, in an easily digestible format. Once you have the extension installed and turned on, you will see the analytics data pop up on any webpage you visit that you have access to in Google Analytics. Keep in mind that this requires that you are logged into the Google account in Chrome that is tied to your Google Analytics account. Metrics such as pageviews, unique pageviews, average time on page, bounce rate, and exit percentage. 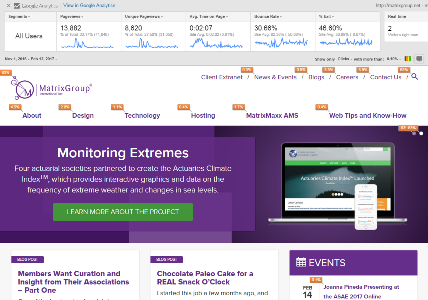 You can also use the date comparison and segmentation tools directly in the extension for these metrics. The number of active, real-time visitors on your site. I love that in the middle of a marketing meeting when someone asks, “Hey – does anyone know if our users are actually clicking on the calls to action in our rotating branding area?” I can quickly pull up our website to see how many people have clicked through in the last month. It’s also a heck of a lot easier to take a quick, high-level peek at the traffic on any given page of our website than it is to log in to Google Analytics and dig for that information. Pretty great, right? While I still very strongly suggest doing a deep dive into your Google Analytics reports once a month at minimum, it’s great to be able to get a rough idea of what pages users are visiting, what’s working, and what’s not working in a matter of seconds. One very important thing to note about the click analysis, however, (and one of my only gripes with this extension as I think it’s a bit misleading at first glance), is that the click-through rate is for each destination page. For example, if you have three separate links to your events page on your homepage – in the navigation, right rail, and footer – they will all show the same number of clicks, even though the link in the navigation may have gotten the most number of individual clicks. Therefore, the click analysis isn’t good indicator of the success of link placement. Just something to keep in mind! What are some of your favorite Chrome extensions for working more efficiently? It’s no secret that we’ve been seriously geeking out about everything Google Analytics here at Matrix Group. We’ve been endlessly exploring, experimenting and testing and have been blown away by the amount of invaluable data we’ve been able to collect for our clients, down to the granular who/what/when/where/how/why. We’ve said it before, and we’ll keeping saying it until we’re blue in the face: you simply can’t afford to ignore your analytics reporting! Want to start digging deeper but not sure where to start? You’re not alone! Our clients frequently ask us for one or two simple things they can do to get started, and our No. 1 answer is: start with UTM codes. UTM codes are code snippets that you can attach to custom URLs that track a source, medium, and campaign name. This information gets passed to Google Analytics and identifies where your traffic is coming from and what campaigns are driving the traffic. Invaluable data! Create a spreadsheet to track codes and campaigns. Having everything planned out and stored in one place will not only help you visualize your whole campaign, but it will also ensure more accurate reporting, especially if you have multiple staff members working on one campaign. Keep your tags consistent. UTM codes are case sensitive, so make sure you stick to the same permutations of upper and lower case! Use dashes, not spaces, to separate words. While a UTM URL builder will allow you to use spaces, it makes the URL look a lot less clean. Example: “CEO blog post” will become CEO%20blog%20post. Instead, try CEO-blog-post. Doesn’t that look better? Use a URL Builder to create links. 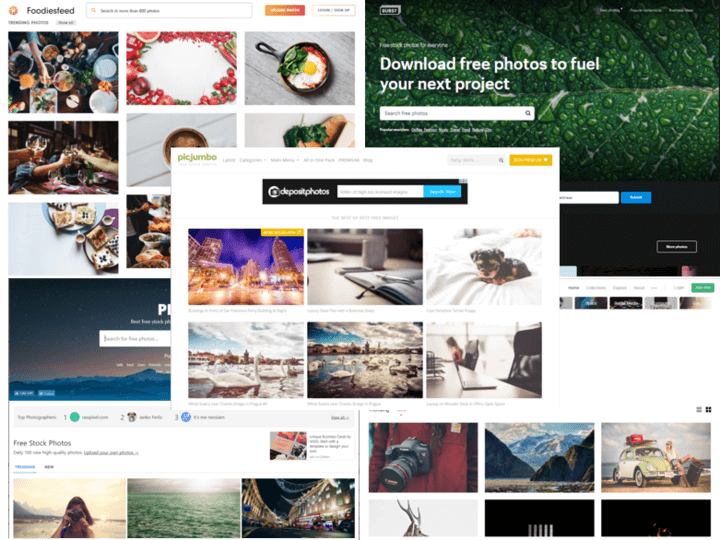 These tools are very easy to use and will save you time and heartburn over building the URLs yourself. Use a URL shortener, where appropriate. When you use UTM codes, the URLs can get quite lengthy and ugly. 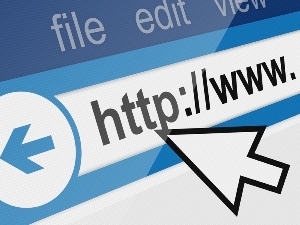 Use URL shorteners to make the links more visually appealing. There are tons of easy-to-use URL shortener tools out there (we like goo.gl), so make use of them! Never send out a link to your site without a UTM code in place! Looking for other Google Analytics tips and tricks? Check out CEO Joanna Pineda’s recent blog posts on Google Analytics. There’s some great info there! If you want a little more hands-on guidance and assistance, don’t hesitate to give us a call. We’d love to help you in any way we can. Have any other tips for getting started with Google Analytics? What are your favorite reports and hacks? Working from home definitely has its perks: time, money, and frustration saved with no commute, fewer distractions (well, hopefully! ), and more flexibility, just to name a few. However, working remotely definitely has its challenges, too. Many people say one of the perks of working from home is just being able to roll out of bed 30 seconds before you need to start working. Sure, in theory that’s true, but I’ve found that if I don’t get up, take a shower, make my bed, and have my morning cup of coffee before I sign on for the day, I am much less productive. In most cases your employer is doing you a favor by allowing you to work from home, so out of respect for that, be sure to show up at your best – fresh-faced and alert. While staying in your pajamas all day and getting paid to do it may sound like a dream – they’re so darn comfortable – many studies have shown that how you are dressed impacts your productivity. You don’t need to put on a suit, but try to wear something that you would be willing to wear out in public. It will shock you how much more alert you will feel throughout the day! …and not on your couch, in your recliner, or on your bed. Just like the clothes you are wearing, your environment can have a strong impact on your productivity. 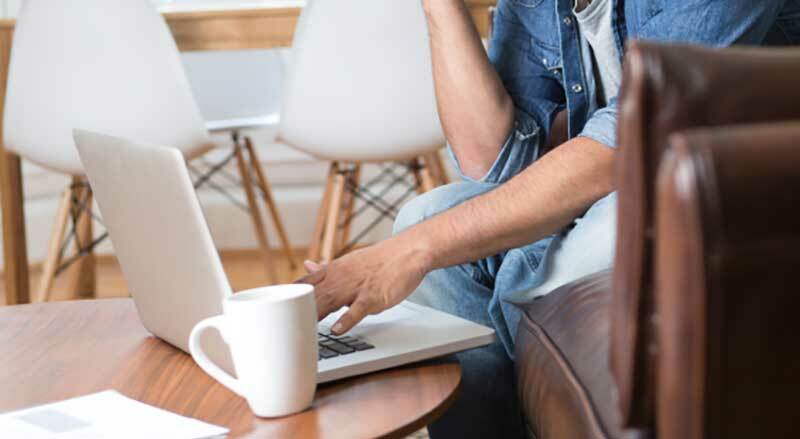 It’s tempting to let yourself get a little more comfortable when you’re working from home, but getting comfortable can be very dangerous. I had a friend who once fell asleep for a couple of hours on the job because they decided to settle in to their big, comfortable recliner for the day. Yikes! This is especially important if you are working at home for multiple days in a row. Make sure you get the change of scenery that you need, whether that means working from a coffee shop for a few hours or spending part of your lunch break running a quick errand or walking around the block. If you have a significant other, roommate, kids, or other family members that will be home during your workday, make sure you set firm boundaries and stick to them. Be clear about the hours you will be working, where you will be located, and under what circumstances (if any) it’s okay to interrupt. While it may be tempting to sneak in a load of laundry or two, unload the dishwasher, or get dinner started, try to save your chores for outside of working hours. Take advantage of the time that you would otherwise be commuting to get the housework done so that you can focus 100% on your job during business hours. Don’t let the fact that you’re physically removed from the office impact your work or work relationships in any way. Call into the office regularly, get on video chat for important meetings, and make sure to stay active on your company instant messenger. It will make all the difference! Do you work from home often? Have any other tips to share about effectively working from home? Please share!